Advanced Spoken English for the real world’ – a program designed to boost your English speaking skills to the next level. This English speaking course features realistic dialogues through the explanation of English grammar that goes beyond the traditional and basic system of learning the English language. The vocabulary section of this advanced English speaking course includes the most commonly idiomatic English expressions you would come across your daily English conversation. This English course at Let’s Talk Institute ( Mumbai) has plenty of interactive exercises to help you improve your English, become fluent in English and accomplish your real life goal to speak English fluently and confidently. This Advanced level English speaking module teaches you English, the way you hear on the streets, in restaurants, at the movie theatre and at parties – It will teach you the English of your friends and co-workers. Carefully designed English speaking course modules with tonnes of role-plays, exercises & vocabulary. 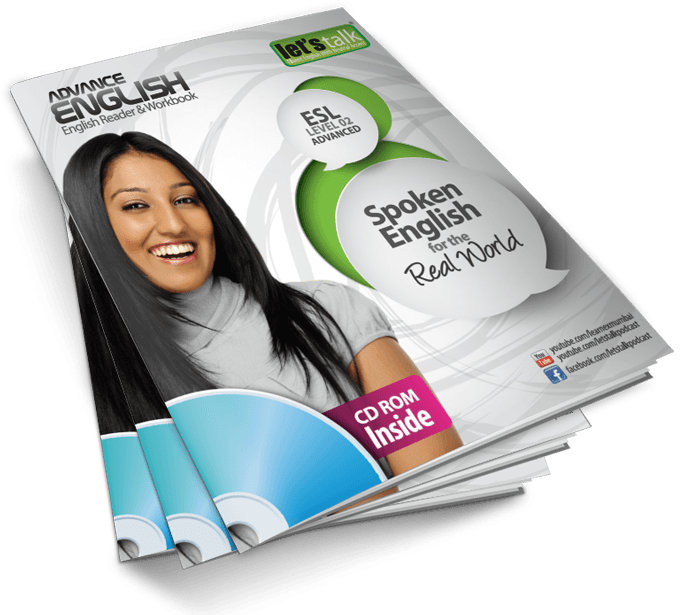 With this basic English course, you would get a Spoken English reader, Spoken English exercise book and an MP3 CD ( copiable to your mobile phone). Take the content wherever you go, learning never stops for you. Learn different types of Nouns, Adverbs, hands on various Tenses.